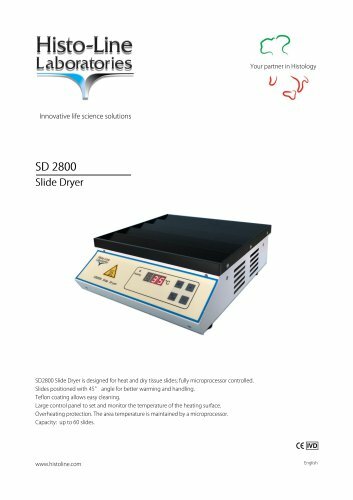 Innovative life science solutions SD2800 Slide Dryer is designed for heat and dry tissue slides; fully microprocessor controlled. Slides positioned with 45° angle for better warming and handling. Teflon coating allows easy cleaning. Large control panel to set and monitor the temperature of the heating surface. Overheating protection. The area temperature is maintained by a microprocessor. Capacity: up to 60 slides.